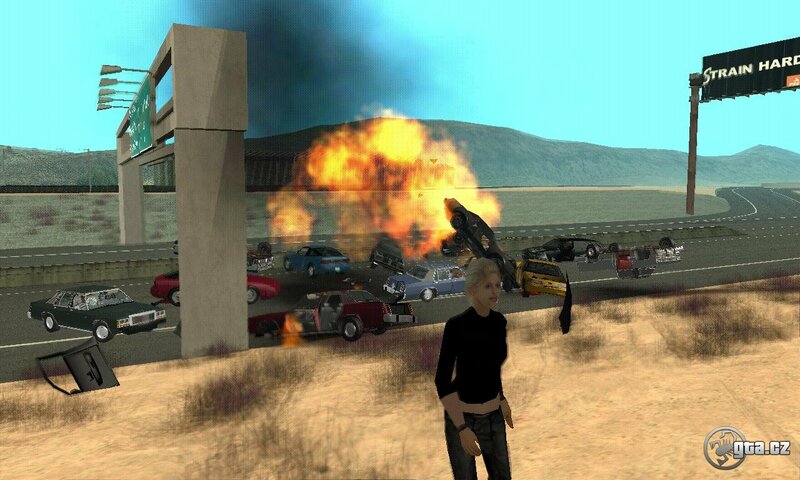 San Andreas has lots of hidden mini-games that can make playing more fun. A popular game, pool is playable in each bar. You usually meet somebody playing billiards. If you kill them, you'll get a billiard cue. You might play with him or her for money. If you like, you can play basketball. The nearest court is just outside of Sweet's house. There you can play for fun. But if you want to play on a team, you must find a bigger court. One is close to the CJ's house above the bridge. Playing is easy. 1. Where to find them? And of course in CJ' house, there is a videogame. You destroy enemy ships with your monkey, similar to Xenon 2. Your bee must manage to pick flowers in time limit. Your ship shoots down white or black balls, or eventually picks them up. A common arcade game where an invasion army from the universe is destroyed by your ship. Another way to play a mini-game is to go to a casino. You can play there and also earn a little extra money. The slot machine is common, where you put in a coin and wait until three of the same symbols appear. You aren't allowed to cheat, so don't try. A simple billiard game you can play in Floor Casino or in any bar. Your wager is corrected by left Shift and left CTRL and is confirmed by space. Now you play. View is rotated by your mouse and white blinking dots show the direction of white ball. You must hit your colored ball into the hole. Your color is determined by what color is hit into the pocket first and by whom. Your color is written in the bottom left corner - either striped (half-colored) or solid (whole-colored). Rules: to get all your balls into the pockets, and then the black one. You don't want to put the black ball into a pocket until all of your other balls are in pockets. Roulette is known by most people. But not everybody knows the meaning of all symbols, that are on the game-table, therefore I described them below. You bet any amount of money on any field and then the croupier spins the roulette wheel. When your bet was right you win some money. You can wager on several fields at a time. But you can't overstep the maximum limit, which can be bet. These numbers are on the roulette wheel. If you bet on them, you'll win only if they are landed on. But you can also bet on two or four numbers at a time by the yellow ring. You'll win, if one of the two or four numbers is landed on. Zero is totally unique, you get 5x more than you bet, but it seldom is landed on. When you bet on a color, you win only when the chosen number has the same color as you bet. So when you bet on red numbers and it fell on red 16, you won. These three fields split numbers into thirds after 12 numbers. If you bet on the first twelve numbers (1st to 12), you'll win when some number fell from 1 to 12. The second third is from 13 to 24 and the third twelve numbers are from 25 to 36. It's similar to thirds. But you can bet on two groups of numbers. The first one is from 1 to 18 and the second group is from 19 to 36. Fairway is split into three columns. Each column includes number up to it. Black Jack is an absolutely stupid game, though it's the most popular casino card game. You must get 21 points. That's all. You can't overstep limit of 21 points. Your score (points) are shown in the left bottom screen. In bottom part of the screen are your cards. Another card is added by left mouse button. You can maximally have five cards. Top part of screen belongs to the dealer, but his first card is hidden. Your bet is doubled by pressing left Shift. And competitor's cards are shown after pressing Space. When you press Space, you'll learn who the winner is. No more and no less than The Wheel of Fortune. On the table are amounts, which you can bet. You can bet on more numbers. The wheel is started by Space and then you just hope, your number will fall. This is probably the most complicated game. But my description is quite clear. Video Poker is a small machine that displays the game. Steps are numbered and I added comments and tips. When you press Deal by Space, the game will start. Five cards will be turned over. You have two rounds to win some money. You can select cards that you want to hold into next round by arrows and space - the button Hold (3). This allows you to keep cards into next round. The button, above the card you want to keep, will turn red. Here is meaning of all words. It starts from the lowest winnings. Jacks or better - you must have at least one pair of Jack (J), Queen (Q), King (K) or ace. Two Pairs - you must have two pairs of cards of the same value, for example: two 5s and two 6s or two aces and two 2s, etc. Straight - you must sweat out a straight from your cards. They don't have to have one color (colors are four in agreement with symbols, not just red and black) only the value. All cards must fit into the straight and they can't be exchange. For people who don't know what the straight is: an ace, two, three, four, five, six, seven, eight, nine, ten, Jack (J), Queen (Q), King (K), ace. Flush - you must have four cards of any value but the same color (symbol) - colors are four (not two). Royal Flush - see Straight, but the straight must be started or finished by the ace. So there are only two possibilities either - ace, two, three, four, five; or ten, Jack (J), Queen (Q), King (K) and ace. Low-Rider Meeting takes place every weekend by EL Coron at the station in Los Santos. Do you want to join in? Do you have a low-rider car? Then there's no problem. Go and join by talking to the man in the red ring. Then only jump in the rhythm of music like in the Caesar Vialpando Mission. The same mission with arrow keys only a dancing style. You have to catch the right rhythm again. You might earn some money from horse-racing too. Just go into a betting office (see a map) and pick a horse (by machine). It's easy - just choose the champion and amount. Then you must wait until you win. The first one is in Los Santos under the bridge and the second one in Montgomery.